There's a lot to like about Apple's new wireless AirPods. From the ease of the initial setup to the small carrying case that doubles as a charger to the sound quality of the speakers and directional mics, the AirPods do a lot of things right -- elegantly, even -- yet they are not entirely without flaws. The $159 wireless headphones were announced back in September, but didn't start shipping until last month and were quickly backordered. Only recently have customers actually started receiving them and they're still a rare find at Apple Stores. (Buying directly from Apple's online store means a six week wait before the order ships.) Apple Store employees have told me that they receive daily shipments, and sell out quickly. Your best bet if you want a pair sooner rather than later is to track availability at your local Apple Store via iStockNow.com. That's what I did just before Christmas. I was able to use the Apple Store iPhone app to purchase my pair on Dec. 21 from the Providence Place Apple Store in Rhode Island as soon as iStockNow's availability indicator lit up green. Within a minute, that store was out of stock. In the box is the pair of AirPods, the small white carrying case that doubles as a charger, a Lightning-to-USB cable similar (if not identical) to the one that ships with iPhones and basic documentation -- a small foldout pamphlet with simple instructions for pairing and using the AirPods. AirPods are compatible with iOS devices capable of running iOS 10, any Mac capable of running macOS Sierra, and any Apple Watch running watchOS 3. To work seamlessly between devices, all must share the same iCloud account. Using the same iCloud account is part of what allows Apple to boast they're "magical;" it makes setup a breeze. Once the AirPods are paired up with one of your Apple devices, they're paired up with all your devices sharing the same iCloud account. 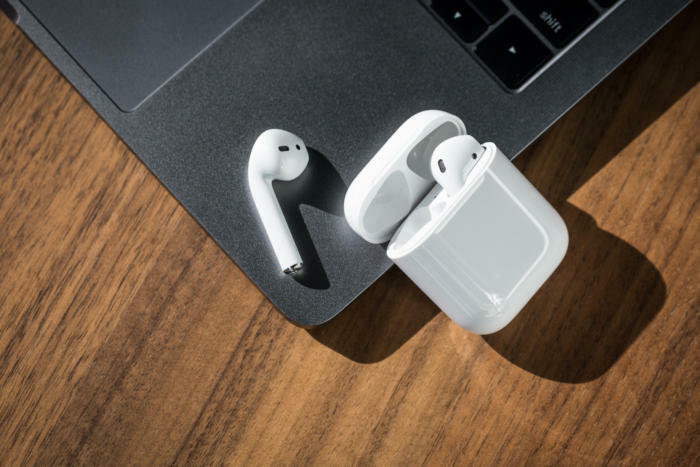 AirPod setup is as follows: unlock your iPhone, open the lid of the AirPod carrying case within a couple of inches of the iPhone, and tap Connect on the iPhone's screen. That's it. Your iPhone -- and now, every Apple device you own -- can use your AirPods. This is possible because they use Apple's custom W1 chipset. It piggy-backs on the existing Bluetooth protocol and means AirPods are compatible with anything that can stream through Bluetooth, including Android phones. The W1 chipset doesn't just help with pairing, though; it is designed to help maintain a stable connection to each individual AirPod while maintaining about five hours of continuous battery life. The AirPods represent Apple's follow-up to the elimination of the analog audio jack in the iPhone 7. In addition to providing a dongle if you need to connect an older pair of headphones, Apple rolled out new technology that improves on current wireless implementations. Notice that I said improved, not perfected. But we'll get to that in a bit. The AirPods are in-ear, but they aren't the type that squeezes into your ear canal. This means wearing them doesn't block ambient noise. 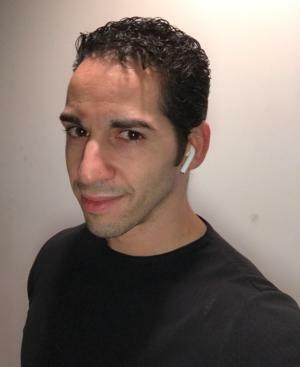 Initially, I used the AirPods one at a time while doing chores or fixing computers at work. But I've found that even with both AirPods in, hearing your surroundings isn't a challenge if the volume is kept low. 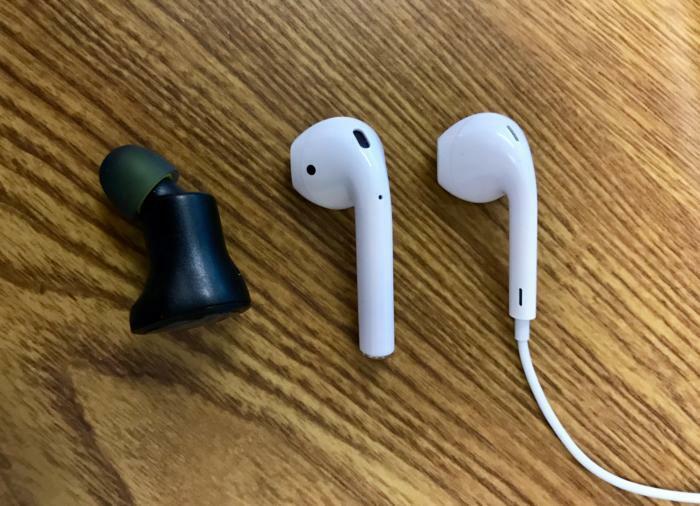 From left to right, a SmartOmi Boots mini wireless earbud, an AirPod and the standard Apple EarPods. There are a couple of ways to interact with the AirPods, but because they lack buttons, actions are limited. Inserting one or both AirPods will sound a chime, alerting you that they're connected and ready. While audio is playing, removing one will pause the audio -- perfect if someone walks up to chat. Placing the AirPod back in your ear automatically resumes whatever you were listening to beforehand. If you remove both AirPods and then put them back in your ear, you have to manually trigger the audio to re-start. Double-tapping either AirPods brings up Siri or Play/Pause your audio source, depending on your setting. (Settings can be changed in the Bluetooth category in iPhone Settings.) And...that's it. To do anything else, you use Siri, which responds to commands for adjusting volume, skipping tracks, starting playlists, and other Siri-related functions like getting the weather, placing phone calls and dictating messages. The built-in microphones pick up audio really well (using what Apple calls a voice accelerometer in concert with the beamforming mics). At work -- in a quiet cube farm environment -- I invoked Siri but didn't want to disturb coworkers with audible commands. To my surprise, the AirPods were able to pick up commands I whispered. Using your voice to control basic functions works well enough; but Siri still needs enhanced capabilities to make the experience better. For instance, using Siri means that there needs to be an active internet connection, even for on-device functions like skipping tracks or volume adjustment. And Siri often displays the answer to a question on the iPhone screen instead of reading it out loud. So in that sense, Siri is a letdown. Just putting the pods in the case for storage means they're getting charged. 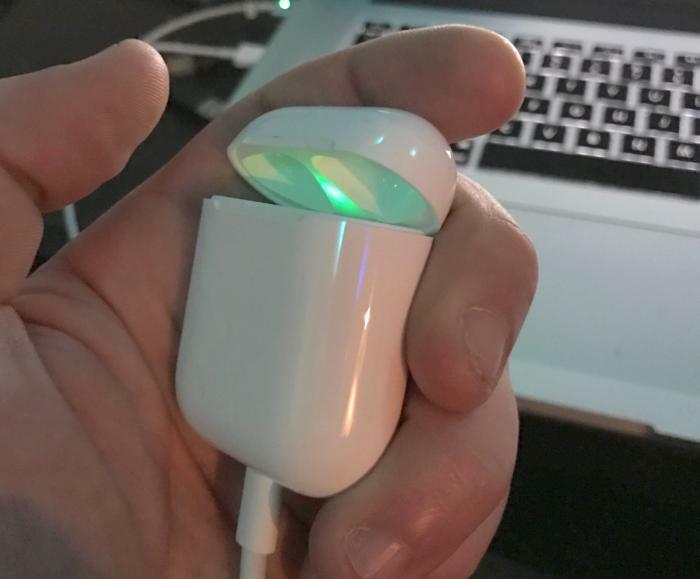 Fifteen minutes of charging buys three hours of audio; on full charge, the AirPods should last for five hours. The case, which is charged with the included Lightning cable, has about 24 hours of battery capacity. In my experience, I've had to charge the case about once a week, while using the AirPods during the work day and for gym sessions. Some people think the AirPods look goofy in use. I don't. The AirPods aren't without issues. I have had several dropped connections, and each time it was embarrassing. In a couple of weeks of daily testing, there were a few times the connection completely dropped and my iPhone speaker broadcast to my coworkers that I was listening to sports radio (Go Patriots!). It's annoying having to scramble for the audio pause button, so I'm hoping Apple will improve the connection behavior in the future. I've also noticed audio cutouts at times, when the sound drops out for a second or so. Interestingly, I've seen more hiccups with macOS than iOS 10. And I should note that a few people have told me they look goofy, in case that matters. But I don't care. Ultimately, the AirPods do much more right than wrong. If you're already in the Apple ecosystem, these AirPods (or even the newest Beats headphones with the W1 chipset) will work very well across all of your devices; if you're not in the Apple ecosystem, these little earphones are still worth checking out. Apple hasn't completely ended wireless audio issues with AirPods, but it's done a damned good job in a few specific areas (like initial setup and audio quality) to make the AirPods worthy of consideration if you're in the market for wireless headphones.